We'll call this one, Thoughts from Thomas' Room, Volume 2. Its alternate title could be, Efforts Thomas Has Perfected To Keep Himself from Sleep. Tonight's edition focuses on the "be very loud" technique. It is, you know, completely impossible to go to sleep while you're sing-yelling. It's also difficult to fall asleep when you have a wicked case of the hiccups, which were probably brought on my gulping too much milk to entertain your brother. To the tune of Baa, Baa, Black Sheep: "Baa, baa, white sheep, blah, blah, (hic). No sir, no sir, stupid, stupid ." Followed shortly thereafter by, roughly mimicking Twinkle, Twinkle: "Bee, bee, bee, bee, (hic), bittle yucky, (hic), bee, bee, bonder yucky you." Eventually this technique leads to the cry for "JUST. ONE. MORE. DRINK. I. HAVE. (hic). BAD. HICCUPS. IN. MY. NECK." The injustice of it all. Hiccups and thunder in one night is just about more than his three-year-old brain can process! We love him with heart and soul but the sound of him losing the fight against sleep will be a welcome one tonight. Andrew and I have officially been rounded up, for Kindergarten that is. Andrew looked forward to roundup for months. He knew what day it would be and even what time. He has forever known where it would be because every time we've gone to the playground there, for as long as he can remember, we've told him that someday this would be his school. I've also always known about the school. My mom taught there for years and while I didn't spend a lot of time at the building, roundup certainly wasn't my first time inside the doors. My neighborhood friends have all talked about the school since before there even was an Andrew. All that limited, peripheral knowledge has created a comfort level with a place with which I've never technically been associated. On roundup day, Andrew and I delivered Thomas to school, ran a couple or errands and still arrived early. I felt like it was MY first day of school. We were greeted by a smiling face at the door and she recognized me from my mom's past life there. Whew. We had this licked. We were ushered into a kindergarten classroom where I was handed a mound of forms and after meeting "the team," Andrew was ushered into another room. He went without a backward glance and with a big smile. I chatted with other parents, chatted with the school nurse, completed many pieces of paperwork and we were told by the principal about how drop-off and pick-up work. We were also given a Parents' Guide to the school by the PTO and notified of myriad volunteer opportunities for parents. About 30 minutes later Andrew was brought back to me. He was as happy as when he'd left and was four pieces of artwork richer upon his return. He had successfully labeled them all with his name and had demonstrated an ability to cut, glue and color inside the lines. He reported that they had checked his vision but if he was screened in anyway beyond that, he hadn't noticed it happening. We were then taken on a tour of the building where we saw the art room (inspiring! ), the music room (fun! ), and the gym and library as well as the classrooms and cafeteria. At that point everyone smiled, thanked us for coming and acted as if we had all learned all we would need to know for a successful academic career at our neighborhood elementary. But, really? Are we ready? I think that's an overwhelming, "yes, we're ready," mixed with a resounding, "we will never be ready." I don't know why I didn't think of this a year ago, but while we were touring the building I had the horrifying realization that we had almost sent him on this journey 12 months ago. We wrestled with that decision and now I saw clearly what a terrible mistake that would have been. Was he ready? I'm not sure. Were we ready? No. And suddenly it became obvious that sending him would have been a mistake for us because we would have cheated ourselves of an entire year of him living in our house. How's that for selfish? I'm sure the trained staff learned all they needed to about Andrew to understand which teacher would be a good fit and enough to see where his basic strengths and challenges lie during their thirty minutes with him. And I can't think of any good questions I should have posed right now, but, really, are we ready? I don't know where the name "roundup" originated for kindergarten orientation and I'm sure someday I'll think it sounds charming, but for now it sounds like herding cattle. The mama bear in me wanted to stand on a table and tell anyone who would listen about how this particular piece of livestock is different than the rest. I didn't even want to paint the picture of a perfect cow, because that wouldn't be accurate, but I wanted to tell someone, anyone, about all the things he does so well and how to best keep him interested in his current pasture so he doesn't try to ram the fence and entertain the rest of the herd. But, alas, I showed restraint. They'll figure it all out, I'm sure, and we'll figure it all out as well. On August 13, we'll just enter the building and look assured as we tell them we're ready. The question is, are they? Tonight Thomas was playing around with his toy trumpet that Santa brought him for Christmas. It's taken until now for him to figure out how to really make it work, but now that the skill is in his grasp, cover your ears. Sometimes Mark plays the real trumpet along with him and he loves that...despite the fact that the noise it makes actually kind of terrifies him. Tonight he wanted me to play with him. There are a number of reasons I don't play the trumpet with him. Chief among those reasons is that I have a fake tooth up front that is worth more than Mark's car and it's not adequately insured. The other primary reason is that I don't know how. I told Thomas I couldn't because I don't have a trumpet. Next thing I know he's off asking Mark to take him to the music store. He told him that they needed to go and buy mommy a trumpet. Mark told him that if I wanted one they could do that. He came running back to me and told me that, "DADDY SAID YES! You don't have to be sad you don't have a trumpet ANYMORE!" Having one of my main men be so concerned about my happiness made my pretty happy. Little known trivia: The third week of April is designated as Week of the Young Child, surprisingly not by Hallmark, but by the National Association for the Education of Young Children. 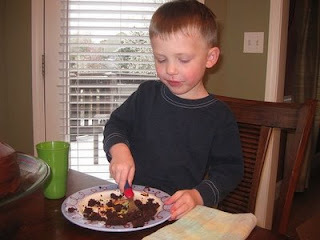 Each year at the kids' school they celebrate the week with special kid-centered activities. 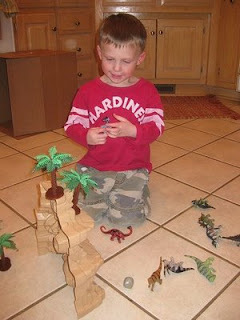 Each day of this week has been assigned a theme and each day there is a centerwide activity that the kids have chosen. The themes include backwards day, crazy hair day, school spirit day, hat day and, the most fun of all...pajama day. For the Henderson boys the best part is that this was their second pajama day because their mom is a genius. The e-mail about these activities came several weeks ago and I dutifully put each one on my calendar so that I wouldn't forget. I would not want my kids to be the only ones NOT wearing their pjs on pajama day. How embarrassing. So, last Monday we loaded up in these same outfits. We walked in the building and were greeted by our favorite teacher who said, "Hey, it's pajama day for the Hendersons?" I of course, replied, "Yes, for Week of the Young Child." "...which is next week," he said. So, Thomas wore his jammies all day last Monday and this Monday because he doesn't care that his mom is challenged. 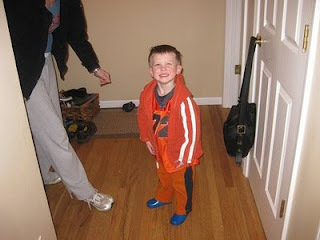 Andrew spent all of last Monday being mortified that he had been seen in his jammies and then had to wear his mismatched spare clothes for the day. And, he made me double check that today was actually the right day. For some reason, he was skeptical. No matter, though, by the time I get through embarrassing them on crazy hair day the pj incident will be the furthest thing from his mind. The following is a transcript of the monologue that occurred in Thomas' room tonight between the time that I left the room and approximately 30 seconds ago. What you are about to read is unedited and may not be suitable for minors. "Momma, I want to come down now." "I am getting out of my bed. IT'S MY CHOICE." "It's so boring in here." "I want to sleep with my 'brudder'." "I am going to get out of this dumb bed." "UggGGHH. I want to get out." "This bed is hurting my leg." "Rock Chalk, Jayhawk, GO KU!!!!" "I need someone to come up." "Actually, it's soooo boring up here." "I am NOT going to come down now." At no time during this soliloquy did I engage in one bit of discussion. We had this same type of outburst-laden wind down last night. I think that when his teacher told us he's relishing his new command of language she just might have been on to something. THOMAS: "Mommy, does the Easter bunny bite?" ANDREW: "I love the Easter bunny better than Santa because he brought all this candy to so many of our houses." THOMAS: "Will Madeline eat the Easter bunny if it's in our yard?" ANDREW: "Does this work like where there's just one bunny for the whole world? Because I'm thinking there should be fifty bunnies. They need one for each state. I'm very worried that the Easter bunny will get too tired if he has to do all fifty." THOMAS: "How does the Easter bunny know me LOVE chocolate?" In the last 36 hours our kids have dyed 18 eggs, completed three egg hunts and eaten their body weight in candy. They also sat like angels through church so they deserved a treat. This is not birthday-related but how could I resist? 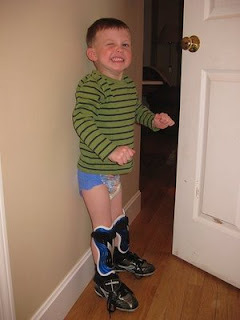 Thomas decided to try on Andrew's soccer gear without any help. Here he's posing as a strong man. 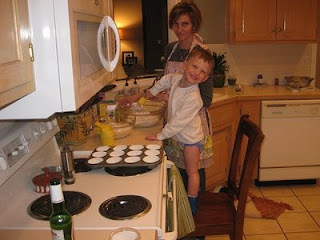 This is the cupcake making event. 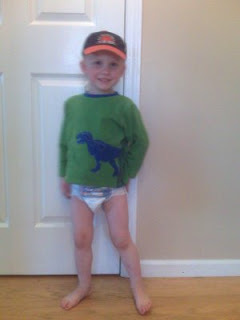 While he may not be wearing any pants, he is wearing rainboots. It's good to be prepared. 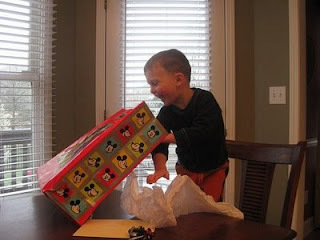 As is typical for our well-loved boys, the birthday celebration began early with the arrival of the first gift. These dinosaurs have gotten a lot of airtime in the last few weeks. 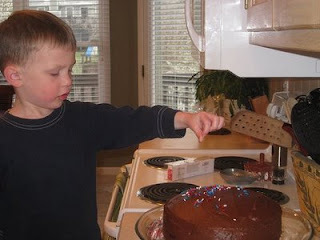 We started his birthday morning with the cake making. "Me love sprinkles!" More presents. This one was so exciting it required standing up. Enjoying cake. And more cake and more cake. All dressed for birthday dinner. Orange remains Thomas' favorite color and he's all about piling as much of it as possible into each outfit. This is the kind of "matching" that kind of makes your eyes water if you encounter it in person. 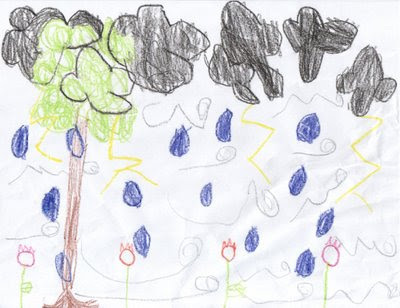 Andrew's depiction of Spring says it all. He forgot to show the snow flurries we've seen today, but otherwise I think he's captured it. We're doing a happy dance here. We're serving M&Ms and stickers. Thomas used the potty twice tonight. The first time was for me and he was seated. Apparently he leveraged that success into a standing maneuver later in the evening for Mark while I was at Bunco. I don't want to be over-confident here, as I'm sure there are still many wet pants to change in my future, but he's just doubled his previous record for potties made at home that weren't in his pants. This calls for a round of M&Ms on the house. Monday was my grandma's 88th birthday. Eighty-eight. Eleven times eight. Seventy-five plus thirteen. Thirty-five plus fifty-three. Eighty-eight. Eighty-eight calls for something special. Unfortunately, Monday was parents' night in Thomas' class and he needed us to be there. He doesn't love school and he's not exactly excelling there right now. It just seemed as though we needed to be there as a family. So, I called my grandma last week and asked if I could take her out to lunch on Monday to celebrate. I couldn't tell if she liked the idea or was disappointed that it wasn't dinner. Then I suggested she invite a friend. I could feel her warming. Hoping to get her excited about it, I said, "Or maybe two or three friends. Whatever you think would be good." She paused, and then said, "Well, I'm not sure I could choose between Jo and Alice." Now we were getting somewhere. That is how it came to be that I escorted my grandma and her two good friends to lunch to celebrate her eighty-eighth birthday. I arrived at my grandma's at 11:30 a.m. sharp. It's pretty typical for me to be a few minutes late everywhere I go. I'm not proud of it, but am cognizant of it. Monday I was right on time. Right on time of course still meant that Grandma and Alice were already waiting outside, with Alice already buckled in the backseat of Grandma's car, which I was set to drive downtown. We left Grandma's and headed east, to pick-up Jo at her retirement community. I started to head there on 15th Street but was quickly informed that Grandma and Alice usually take 6th Street when they visit. Sixth Street it is! We arrived at Jo's and I followed the directions I was getting from the passenger seat on how to enter the circle drive. As I proceeded, my backseat passenger said, "Oh, Jo isn't going to like this! She likes it when we come in the other way." With my third passenger safely buckled, we headed out. I delivered my companions to the restaurant and we enjoyed what I thought was a delicious lunch. Jo and Alice both ordered Ruebens and our good friend Ben says you can never go wrong with a Rueben. I hope Ben's right. Grandma was intrigued by the "Veggie Melt" on the menu. It's the kind of place where the menu gives you little to go on in terms of what exactly you're ordering. I guess it's an attempt at making a veggie sandwich worthy of the white tablecloths? She did exactly what a good grandma and lunch companion does, which is rave about it. I think it could have been cardboard and she wouldn't have admitted it because she was the bravest orderer at the table and was proud of it. We had a leisurely lunch. That was partly because there was no place we had to be and partly because that's how they roll. I am fairly clock-conscious. I have to be that way at work, because the person who signs my paycheck is, and outside of work it seems that if I'm not, we don't accomplish all we should to keep our household on track. But that day I made a conscious decision to ignore my watch and just let it happen. I knew I was leaving work early and would be returning late. The interesting thing is that when lunch was over I was genuinely surprised by how late it was. The old saying is true. I was amazed by the friendship of these three women. I had met both of grandma's friends before but was guilty of never having had a real conversation with either of them. Alice has five children, fourteen grandchildren and soon-to-be-fifteen great-grandchildren. Jo has lived all over the country. Who knew? I learned that they gossip about their retirement communities the same way my friends and I do about our kids' schools. They compare notes about their doctors the same way my friends and I do about our doctors and they discuss their neighbors the same way we do as well. It's just fast-forwarded fifty years. Grandma, Alice and Jo have only known each other for a few years, since moving into the same living community. They never knew one another's husbands. They never knew each other as working women, which they all were in one way or another. They just know each other in the now. And in the now, they support each other just like my friends and I try to do. They take turns driving to card club. They take turns hosting. They bring each other treats unexpectedly and they share books. They are like my bunco group, book club and lunch buddies all rolled into one. They have a bit of collective wisdom. After we shared some mango sorbet and carrot cake we loaded up and headed back to their respective homes. They made plans for who would host cards on Thursday and they thanked me profusely as we parted ways. We all have lessons we can learn from each other and I firmly believe that we have certain people in our lives for certain reasons. It occured to me that because they're eighty-eight, they've reached a place in life where they can be lots of things to each other. There was no pretense between them. They don't seem to choose to make time for it and there's certainly a lesson in that. I returned to work 2.5 hours after I first left and my absence had been noted. It's funny how much I didn't really care. I don't think Jo and Alice and Grandma would advise me to worry so much about the clock. Today I received a thank you note from Jo. It was handwritten and it came to my house. What a treat. It was definitely me who should have written the thank yous.